Telenor is one of the most popular telecom companies around and especially in the youth. This brings us to the question that what Telenor night call packages are the best of all. You can find all the details of every night call packages from Telenor Djuice and Telenor Talk Shawk that you can use including its charges and the method to activate the package. Telenor announces a best offer from which you can call to any Telenor number from 12am to 6am for Rs. 1.5 per minute excluding taxes. The call becomes free after five minutes for the whole hour. These rates are applicable to Telenor Talkshawk Economy package. On Telenor Talkshawk Har Minute package, the charges are Rs.1 per minute for the same tariff of 12am to 6am. On 6am to 6pm tariff, the charges are Rs.0.99 per minute on Telenor Talkshawk Economy package and Rs.1 per minute excluding taxes on Telenor Talkshawk Har Minute package. In this tariff, 5 free minutes are offered after every 5 minutes. From 6pm to 12am, the charges are Rs.1.5 per minute without taxes but no free minutes offer lies with Telenor Talkshawk Economy package. 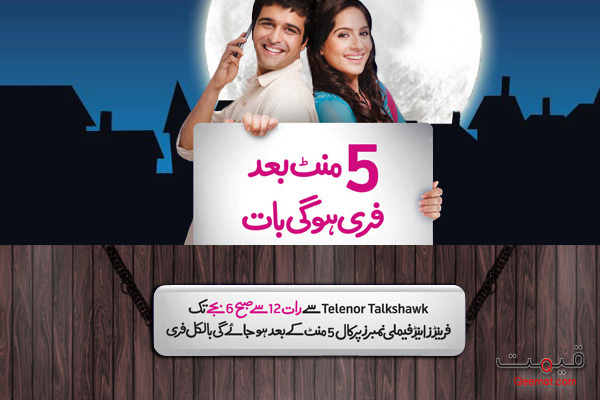 On Telenor Talkshawk Har Minute package, you will get 5 free minutes after every 5 minutes on this tariff. This Talkshawk Late Night Offer is applicable only on FnF numbers. No activation is required for this offer as it automatically applies to all existing and newly added FnF numbers in subscriber’s list. You can talk to 5 FnF numbers for just Rs.3.5 per hour exclusive of taxes from 11pm to 5pm. The daily subscription charges for this offer are Rs.1.99 and this offer is not valid from 5pm to 11pm daily. You can talk to Onnet FnF numbers for Rs.4 per hour excluding taxes from 12am to 1am. From 1am to 6am, all Telenor to Telenor calls become free on Djuice Jaagtay Raho package. From 6am to 8am, a call will cost you Rs.4 per hour. From 8am to 5pm, the charges are Rs.0.50 per 30 seconds and call becomes free after 10 minutes. This package also costs Rs.4 daily for subscription fee. The Djuice Jaagtay Raho customers do not have to subscribe to get this lovely offer. This package is not applicable from 5pm to 12am. wa yar bhoot acha package hy.Telenor Djuice Din Raat Day Night wala package acha hy ap..student logo ky liye bhooot acha package hy….